So the reason I have been crazzy busy and absolutely shattered recently is because I have been working for the Queensland State Government in the Department of Premier & Cabinet as a project co-ordinator working on the Queensland Disaster Heroes programme. It has been a great couple of months and fantastic to get back into the events industry, properly organising events and all! 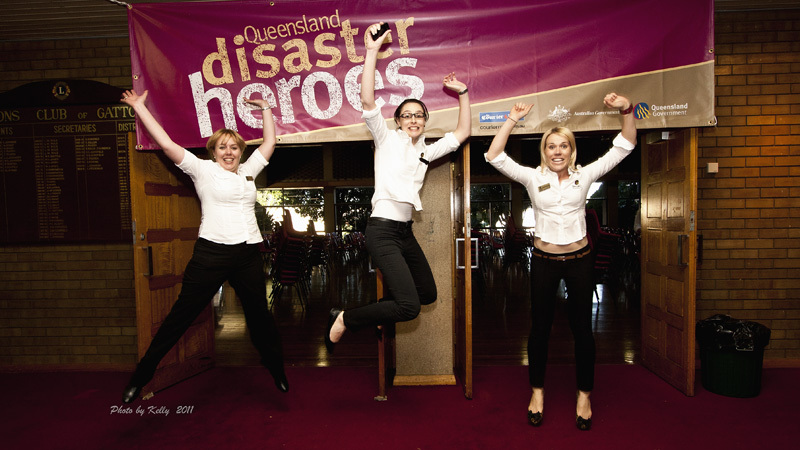 The programme has been to recognise all those people who have been nominated by their peers for their work during the floods and cyclone that have ravaged Queensland over the last couple of months. There have been 10 events which have coincided with Queensland Week and I have been looking after 4 of them in Lockyer Valley (Gatton), Townsville, Emerald and Toowoomba. They are fairly straightforward ceremonies but have meant so much to so many people that it has been an absolute pleasure to be involved in them. Lockyer Valley was the first event and the most nervous I have been about work for about 4 years, which is the last time I stage managed an AV event! It all went super smoothly and I spent much of the ceremony dancing around backstage doing the victory dance with no shoes on when it all went right. We then moved on to Townsville where the event was held in a marquee (I can't believe I came to the other side of the world and one on the first events I did had a marquee involved!!) which again went really well, then it was off to Emerald (inland Central Queensland) where the event went well for the people viewing it but wasn't quite as smooth for me when I had to run round the outside of the venue to pass on a vital piece of information to the choir! We then moved on to Toowoomba for my final event and I was so pleased with how it went (although there was less dancing as I had regained my professionalness by then!). Although all areas that had ceremonies were hit hard by the disasters it was really amazing to see see how they have bounced back since January and the strength and resilience of the people was phenomenal. Many people said how they didn't think they were a hero and part of our job was to explain that someone thought they were and that was the most important thing! For those that I spoke to before I left about what I could do to help when I got here, it may not have been aid work or anything like it but recognising those people that went above and beyond the call of duty was a fantastic thing and I am so glad to have been involved! I, of course, met some lovely people both out at the events and also in the office where I worked and I will be sad when my contract ends on Friday to not be working with them all everyday. A truly lovely group of people! Just the one shot to show our silliness on the event with Kate and Prue....this is the one from our first event in Lockyer and I have 3 more of the team at each event that I did....definitely one for the photo album when I get back home!